This week’s A-Z Archive is the letter “K,” and it was more challenging than past letters. I had a number of thoughts as I roamed through my 2011 images where soccer “kicks” were plentiful, “kids” played games and “kisses” were caught on occasion. Then, I recalled my evening spent last summer on the Mall, when for the first time I visited the Martin Luther King Jr. Memorial. As the sun set, I photographed the monument and observed the many people pausing to pay their respects. Some were solemn, some laughed with joy and a few shed tears as they finally came face-to-face with a long-awaited tribute to a hero. It was a reflective evening that reminded me of how far we’ve come but also the distance we have yet to travel on this continuing path to equality. 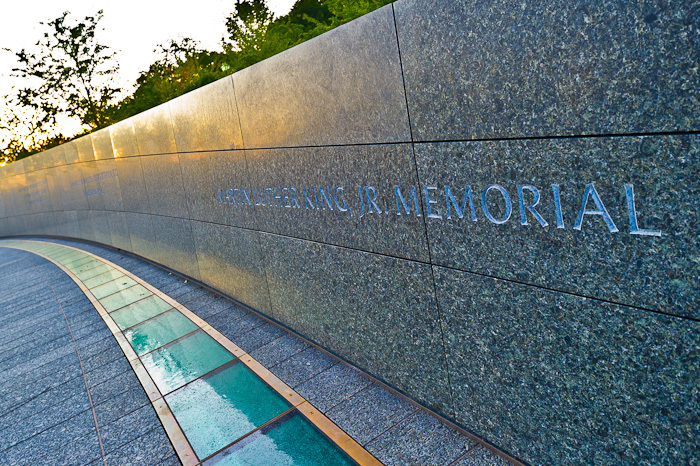 Categories: Travel • Tags: A-Z Archive, artistic, Martin Luther King Jr. Monument, Nikon D3s, photography, postaday, Washington D.C.
Man, I can’t wait until I get the chance to visit the MLK Memorial. It is such a wonderful monument! So glad it finally happened! It’s a beautiful monument. I look forward to returning again soon. I really like the perspective you chose for this shot. Well done Tricia!!! Thanks, David. It’s a little different. I would like to return again and spend more time. I was with a small group and didn’t have the opportunity to really explore. Another trip to D.C. is on my to-do list!